NEW! Sign up today for our Home For The Holidays BOW! Details Below: You are welcome to begin this BOM any time. 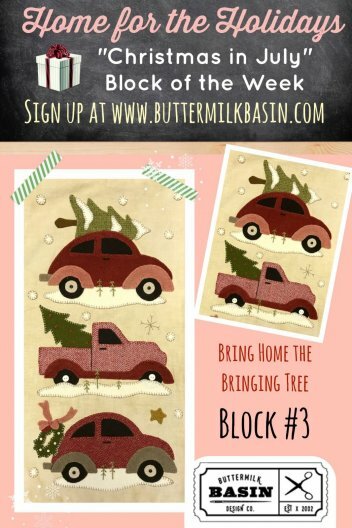 Every week for 8 weeks, we will send the blocks and a finishing kit for our Home For the Holidays Quilt as a kit for those who sign up either online for the subscription, or call the shop to be put on auto ship. The blocks will not be available to purchase outside of the subscription or autoship. The kits will contain all of the wool and fabric to complete the quilt top. 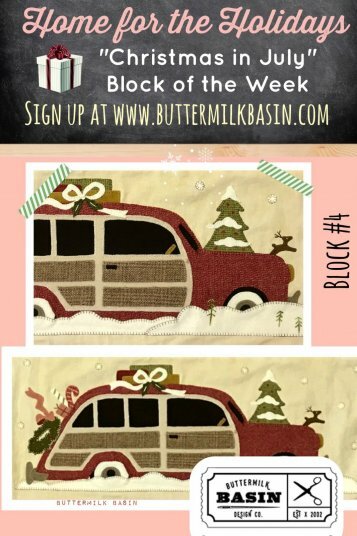 A thread kit and button pack are available to purchase separately.To sign up for the online subscription, go to the tab below that says "Information for Autopay for Home for the Holidays BOW". To sign up for the online subscription, you must have a Paypal account. If you do not have a Paypal account, please call the shop to sign up for Autoship, at 763-792-0638. The online subscription is not available to MN residents, so please call the shop to sign up for autoship if you are a MN resident. The cost is $39.95 per week, which includes shipping to customers in the U.S. If you are an international customer, we will bill you for additional shipping. 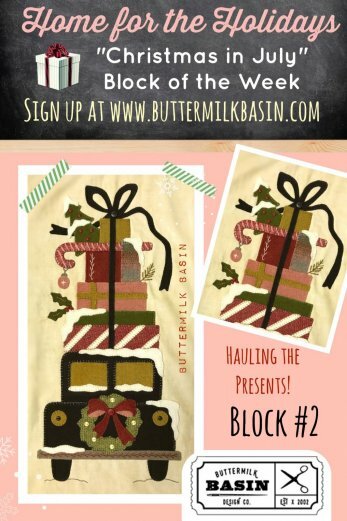 Block #1 is just a hoot! Mr. Claus if living large this Holiday season in his vintage Holiday camper! He couldn't be more jolly as he delivers his gifts to everyone on the "nice" list! HO HO HO! Block #2 is a classic! Tis' the Season to give!!! Check out this haul of gifts heading Home for the Holidays! Good thing the weather is good while traveling! Block #3 is sooo cute! Everyone is hauling the tree home for the holidays! Next stop... over the river and thru the woods to grandma's! 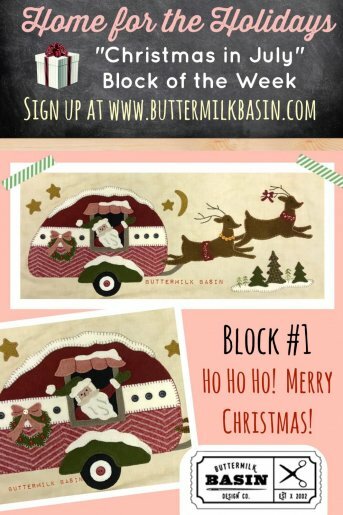 Join our "Home For The Holidays" Block of the Week! The Home For the Holidays BOW runs for 8 weeks, the cost is $39.95 per week (includes shipping for customers in the U.S.). 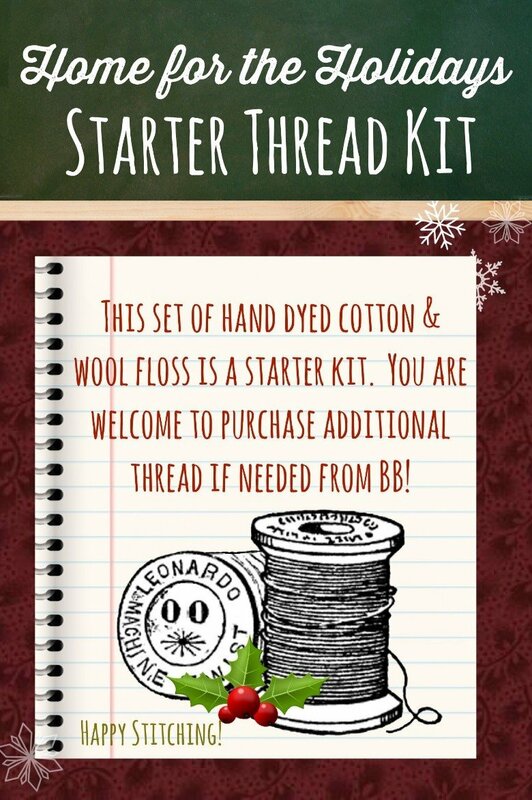 The starter thread kit for the Home For The Holidays BOW! includes 13 hand dyed flosses that will be used throughout the quilt! As this is a starter kit, we will have the flosses available for you to purchase as needed. This is the button pack for block #1 of the Home For The Holidays BOW! It includes the 22 hand dyed buttons that are on block #1. This is the button pack for block #2 of the Home For The Holidays BOW! It includes the 16 hand dyed buttons that are on block #2. This is the button pack for block #4 of the Home For The Holidays BOW! It includes the 16 hand dyed buttons that are on block #4. 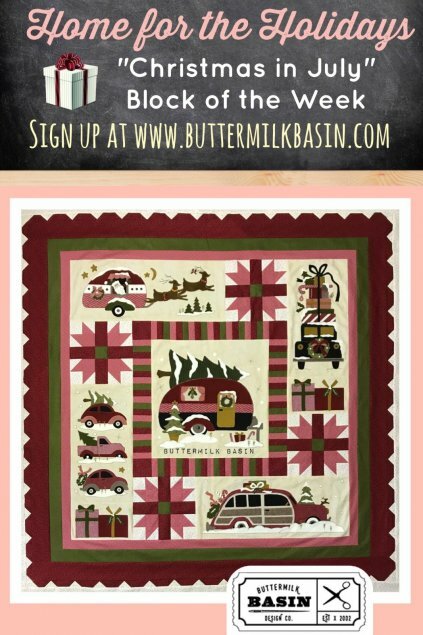 This is the button pack for block #5 of the Home For The Holidays BOW! It includes the 19 hand dyed buttons that are on block #6.